The post has been updated with a correction and a second graph. [Later...] Okay, one final note I meant to mention (this post is a case study in inattention). Breweries could enter four beers, and nearly all did (there were just over 2200 breweries in competition with just under 8000 entries.) So if you want to know how many brewers each state had, divide by four and you'll have a decent approximation. Each year, states proudly boast of their medal count at the Great American Beer Fest. And why not?--every medal is worth celebrating. But that's just half the picture--the numerator, if you will. A state that wins ten medals out of a pool of a hundred entered beers is doing better than one that wins ten medals but entered 200. To really get a sense of things, you need the denominator--the entries. Fortunately, the Brewers Association has exactly the man for the job, Bart Watson, who always provides fascinating information for us to consider. Yesterday afternoon, he sent over the figures for the states with the top 20 medals won along with the number of entries. He even calculated the win percentage so I didn't have to. 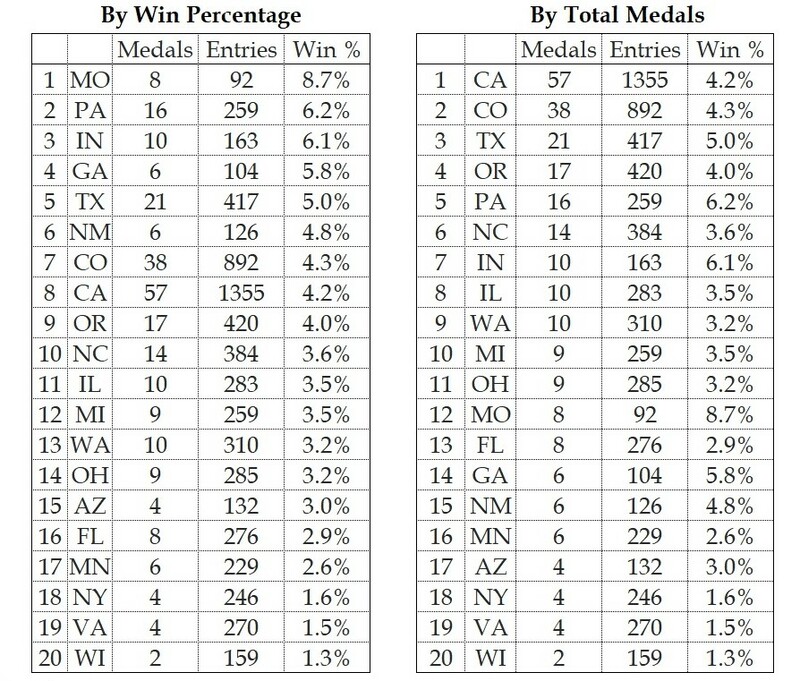 [Correction: the list was the top twenty states by number of entries; some states, like Wyoming, may both have won more medals (5), but missed the cutoff because of low entries--which means the Cowboy state had a booming 10.9% win total.] 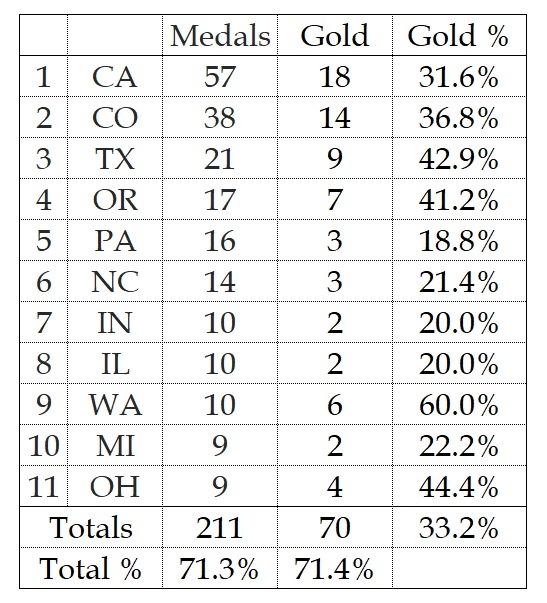 Below are the top states arranged both in terms of total medals and win percentage. There were 7,923 entries and just 293 winners--an overall win percentage of 3.7%, a line that just about perfectly divides the states listed here, too. What should we take away from this little exercise? Aside from Show Me's bragging rights, I'd be cautious. (Actually, give the Lone Star state a little love, too--breweries there did great in win percentage and total medals.) We're dealing with pretty small numbers here. A medal one way or another ticks the percentage up noticeably, and every state has year-by-year variation. Oregon, for example, won 22 medals in 2014, 19 in 2015, 21 in 2016, and 17 this year. California's totals over the same span were 46, 67, 68, and 57. Missouri, which had a banner year in 2017 with eight medals, only had eleven in the three previous years combined. And of course you could get into the whole gold, silver, bronze thing. Is it better to win six golds and ten overall or fifteen overall and four golds? But let's not go down that road for now, because such an analysis has an even bigger small-number problem. In other words, don't make too much of it. Unless you're Missouri, in which case go crazy. It's fun to see the numbers, but we probably can't draw too many sweeping conclusions from them.